Britain’s managed pub and restaurant groups saw collective like-for-like sales grow 3.8% in March compared to the same month last year, when trading was hit badly by the effects of the ‘Beast from the East’, latest figures from the Coffer Peach Business Tracker show. “March last year was a month to forget when snow brought much of the country to a standstill. Both pubs and restaurants felt the effects with like-for-likes across the board down 3.1%, so these latest figures will be a relief as the sector regains lost ground,” said Karl Chessell, director of CGA, the business insight consultancy that produces the Tracker, in partnership with The Coffer Group and RSM. “Pubs also saw a recovery in both food and drink sales over the month, although drinks trade grew 5.7% against a smaller 2.7% increase in food, suggesting that the underlying trend for drink sales to outstrip food sales is continuing,” added Chessell. “These results show that revenue levels across the sector returned to March 2017 levels last month. The market remains challenging for many casual dining operators who continue to face unprecedented levels of competition. The wide variety of choice including the popularity of food halls, markets and pop-up street food offers around the country continues to draw custom away from conventional restaurant and pub outlets and are increasingly the social meeting place of choice for younger consumers,” said Trevor Watson, Executive Director – Valuations at Davis Coffer Lyons. 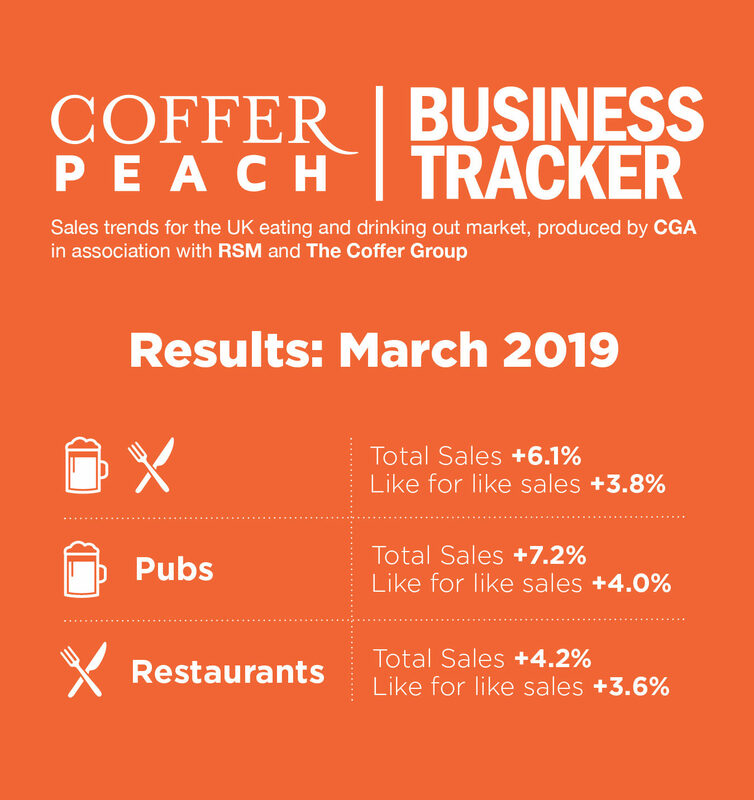 The Coffer Peach Tracker industry sales monitor for the UK pub, bar and restaurant sector collects and analyses performance data from 52 operating groups, with a combined turnover of over £9bn, and is the established industry benchmark. CGA Peach collects sales figures directly 52 leading companies. Participants include: Alchemist, All Star Lanes, Amber Taverns, Azzurri Group (Zizzi, ASK, etc. ), Banana Tree Restaurants, Bills, Byron, Carluccio’s Restaurants, Casual Dining Group (Café Rouge, Bella Italia, Las Iguanas), City District Enterprise (Fazenda), Coaching Inn Group, Deltic Group, Dominion Hospitality, Downing LLP (investment partner of Antic London), Ei Group (Bermondsey Pub Company), Fuller Smith & Turner, Gaucho Grill, Giraffe Restaurants Group, Greene King (Chef & Brewer, Flaming Grill, Fayre & Square), Gusto, Hall & Woodhouse, Honest Burgers, Laine Pub Company, Le Bistrot Pierre, Le Pain Quotidien, Liberation, Living Ventures, Loungers, Marston’s, McMullen & Sons, Mitchells & Butlers (Harvester, Toby, Miller & Carter, All Bar One etc), Mowgli, New World Trading Company, Novus Leisure Limited, Peach Pub Company, Pizza Express, Pizza Hut UK, Polpo, Prezzo plc, Punch Pub Company, Restaurant Group (Frankie & Bennys, Chiquitos, Brunning & Price), Revolution Bars Group, Rileys, Snug Bar, Stonegate Pub Company (Slug & Lettuce, Yates’, Walkabout), TGI Fridays UK Limited, Various Eateries (Strada, Coppa Club), Wadworth & Co Limited, Wagamama, Whitbread (Beefeater, Brewers Fayre, Table Table), Yo! Sushi, Youngs.